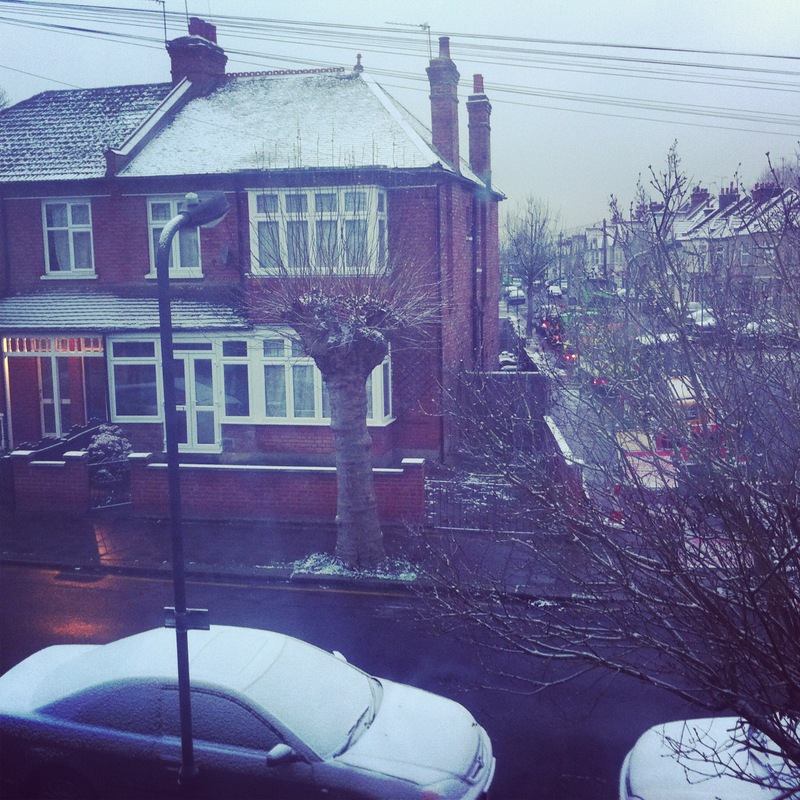 It’s the first snowfall of the season in London, the first snowflakes of 2013. As the temperature hovers around 1 degrees Celsius, and some parts of the UK blanketed in snow, it’s lucky enough to be stay indoors, sipping some hot chocolate. I know it’s just another cold day in London. But coming from a place where it never snows, the white flakes are something of an excitement; it’s thrilling if I were to exaggerate my feelings. But as the ground gets covered in snow and soon the white surface turns muddy and dirty, it might just be a different thrill then. For now, I’ll enjoy the snow while it lasts. Also, from the archives, here’s a short piece I did for Westminster News Online. Until a few days ago, the world was almost ending. But now, with only eight more days to go, the year 2012 is living its last days. And here I am trying to sum up my 2012 – it’s been some sort of blogging tradition for me where I just sit down and reflect on my year. In 2009, I wrote a blog post from Delhi airport: It was a big year for me. I had graduated from college, secured my dream internship and moving home to Nepal. The came 2010: The year was a big career booster for me. I was finally able to translate my visions into action. That year I wrote about how accomplished I felt after having working for the first time in my life. And it was 2011: It was a year where I was in transition. Here I was a student again, learning and living a freelance life. In a personal post, I wrote about looking forward to 2012. And here it was (still is), 2012, presumably the last year until a few days ago – some thought the Mayan calendar predicted that the world would end on Dec. 21, 2012. But, like everyone else, I survived, and here’s my short survival story. I survived school: I survived those countless hours and sleepless nights in front of the computer, trying to get the HTML codes right. I lived up to those deadly deadlines, and also datelines. I survived the London Olympics: I’m using the word survive here because there was some sort of hysteria that the city would not function with the influx of millions of people. But as a matter of fact, those two weeks were the best – it was one of the greatest times to be in London and soak up the Olympic spirit (here’s my post). I survived unemployment: One of the biggest lessons I’ve learned this year is that I must create opportunities for myself. And that’s what I did – I lived the freelance life. And even though I didn’t have a job, I was doing all that I have ever wanted to do in life. If anything this year has taught me is to survive and continue doing what I love and want to do regardless of all the obstacles. It has forced me to accept challenges and prove myself wrong – that I can do things that I thought I wouldn’t have otherwise. 2012 has brought me a year closer to living my dreams to the fullest, accomplishing my goals I germinated years back when no one, including myself, didn’t believe that actually one day, it would come true. With the year rapidly coming to a close, 2013 only looks brighter as I’m predicting my own future. For now, I have another dream internship. I’m moving back to Nepal, again. And I’m sure that I will translate my 2012 life and learning into something substantial. At this point, I’m just happy that I’m still living, and the world just didn’t end. For me, my world would end when I stop striving for my dreams and submit myself to the misery of making unsettling compromises. But that day is not even close. So I’ll keep living. Graduation – it’s a time to celebrate our academic achievements, reflect on the past and awkwardly smile as we take a step to an unpredictable future. Yesterday, along with my 40 other friends from around the world, I just did that. During the commencement speech, speakers resonated similar sentiments: they commended for our efforts, congratulated on our success and then consoled us that we all would do great, get jobs and make a difference in the real world. But before making a real difference, at this very moment, we are trying to make ourselves noticed. It’s strange that despite our skills, abilities and the academic records, a majority of us – all international students – are not being able to get a call back for an interview; landing a job seems like a distant dream. The job market is competitive and constantly changing: it requires us to have skills that is a rarity, be among the best of the best. And in our own ways we all are. Though we are competing against each other, we bring in a unique set of skills with us. We have our strengths, and we know that we can make a difference. So we have focused on those skills and started to capitalize on them: One friend is starting a website, the other is using his multi-language skills to translate, another is using his web skills to freelance. And s for me, I’m hunting stories, pitching them like crazy – with fewer approvals – and reporting, which I have always longed. The only difference now is that I care less about the medium for I can work on multiple platforms now. And graduate school has really come to be helpful for that reason. It has transformed me from a purely print reporter to a multimedia man. The projects were daunting and the deadlines persistent – from producing a radio news report in about two hours from scratch for the hourly newscast to finishing a two-minute video for the 4 O’ clock student broadcast, I proved myself wrong that I was technologically inept. The group website that we handled collectively, my individual portfolio site and a final solo multimedia project have only made me more comfortable with multimedia. For me, I would say graduate school has been a training ground. And being in London, I have made the best out of it. I have written from local news to international political protests, produced videos on social issues, interviewed music bands as a part of radio interview and blogged about travel, lifestyle and fashion. As I reflect on my time at the university and life in London, I don’t think I have much to complain. Today, I graduate not as a journalism student but as a multimedia journalist with an ability to write, report and get the stories. I do realize that it’s difficult to break into big media companies or even get a full-time job at a small publishing house. But it wouldn’t deter me and of course my fellow graduates, from doing what we do best. And I’m glad that we’ve become leaders in our own ways, focusing on our strengths and banking on the small and big opportunities in London and our home countries. And that’s what it’s all about – the degree that we have endorses our skills and abilities, but at the end of the day, we have to make it work for ourselves. Graduate school never promised us with jobs but only prepared us to be what we envisioned ourselves to be. For some, it is the morning show host, for some it’s the radio presenter job, and even a communications job at a fashion house. Slowly but steadily, we are getting there. We will get there. To all my fellow classmates and friends, we did it. and I’m sure we will do our best in the coming days. Congratulations. Cheers, to the University of Westminster Postgraduate Journalism Class of 2012. Dalawar Chaudhry with Tiara. It cost him about US$100,000 to ship the bus from Karachi to London. I’ve been living in London for more than a year now. Like every Londoner, I’ve been riding the buses and using the tubes. But last month, I had a different kind of ride on a bus that stands out from all the other vehicles on London’s roads. 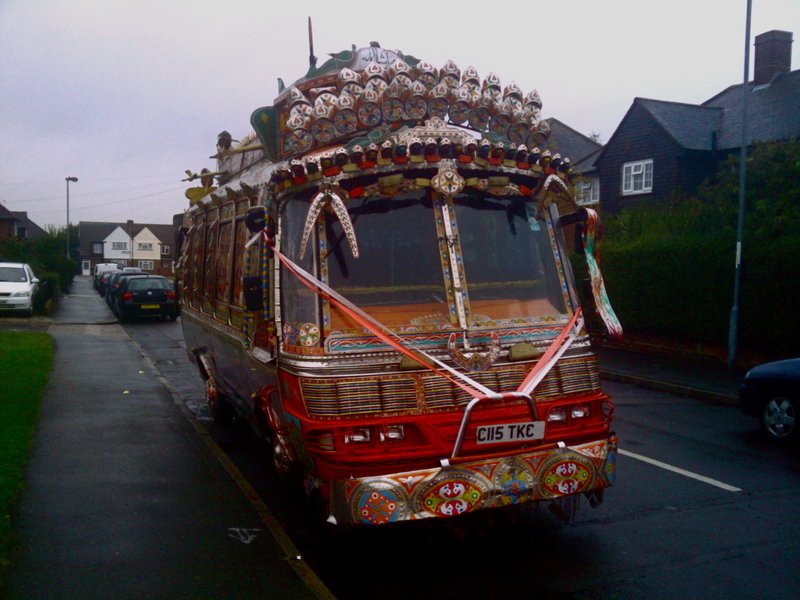 This minibus, called the Tiara, is an import from Pakistan and looks like a bejewelled caravan – it’s a heavily ornamented and highly decorated Pakistani bus in London. I noticed the Tiara last year during the Eid Festival at Trafalgar Square. But it wasn’t until last month that I thought of working on the story – a story on the bus. So when I called its owner, Dalawar Chaudhry, he agreed to give me a ride. My last ride on such a bus was during my visit to Kashmir, but it wasn’t anything like Tiara. At times, it’s surprising what you might just come across London, and Tiara was definitely a sweet surprise. From the outside, every visible part of Chaudhry’s Tiara, a 2000 Mazda, is tattooed with multicoloured paintings of plants, birds and animals along with Urdu inscriptions. The two entrances of this customised vehicle are painted in patterns of blue, green, red and yellow, and every window is tinted with designs that pay tribute to the heritage and artistic flair of the Sindhi culture. People in this Pakistani culture, according to Chaudhry, also associate colours with the ability to combat negative energy; therefore the rainbow effect adds a spiritual element to the bus. 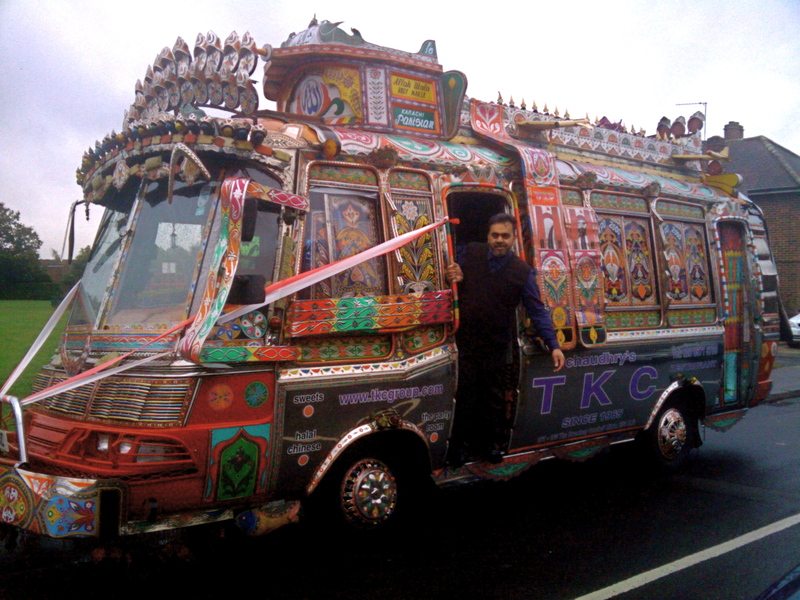 The top of the bus is festooned with Islamic inscriptions along with the Pakistani national flag, but the highlight is the assortment of coloured lights that form an arc right above the windscreen, along with a metallic mosaic on top reminiscent of a tiara on a beauty queen’s head. But it does not end here. Chaudhry has worked equally to beautify the bumper and has even changed the rims of each of its wheels, making them pertinent to the cultural motif. If the exterior of the bus is captivating, the interior is an invitation to experience the ride. Chaudhry wants people away from his homeland to relive their days of using the local transport and wants Londoners to be momentarily transported to Pakistan aboard the bus. It is a noisy journey aboard Tiara. The engine makes a thunderous bellow, while the racket of the little bells and beads hung on the bus provides an uninterrupted, one-of-a-kind soundtrack to the trip. The cushioned seats are dressed in red covers complementing the colourful decor. And the interior, otherwise dimmed by the tinted windows, lights up with the bulbs behind the coloured glass shades on each side of the passenger seats – call it mood lighting or an experience enhancer, it does the trick. Last week, I paid £3 to see San Zhi at the Dalston Servant Quarters, and I must say that it’s one of the best gigs I’ve been to in a long time. This new London-based band is not only impressive but gets infectious. I came across San Zhi through a friend who is a friend to Suraya, the female vocalist of the duo; the other member is vocalist and guitarist Peter Howarth-Brown. The Egyptian and English duo met during their university studies and what started as a bedroom project is now out in an EP form. San Zhi’s music is dreamy. Their single “Ice Light” starts with drum beats which in seconds is overlapped by guitars and keyboard before Suraya and Peter’s vocals sets that dreamy mood. While Suraya’s voice is distinct, Peter’s voice is difficult to ignore – there is some sort of unparalleled harmony that works perfectly fine. “Blakholes” also start with a distinct drum beat and a constant keyboard tune until Suraya kicks in – listening to the song, again, it’s very dreamy with a dose of heavy guitar and vocals that’ll at least keep you awake and make you realize that you’re still in San Zhi’s musical sphere. “It struck us how many metaphors are being used to describe our music and perhaps especially those conveying the feeling of being transported into another world,” Suraya told me. San Zhi’s music, according to Suraya is all about how they feel. San Zhi’s music has been on a loop since I’ve discovered them – it’s addictive. I’m very much looking forward for their music in future, and hopefully a great album. In “Lagerfeld Confidential,” a documentary about Chanel’s creative director and design head, Karl Lagerfeld talks how his interest in photography germinated: He wanted to break away from the prototype, be in control of the shoots and moreover present an artistic side in his photographs. Lagerfeld’s photo series titled “The Little Black Jacket” currently being exhibited at the Saatchi Gallery in London proves just that. The subject of the photo series is Chanel’s little black jacket — and yes, it’s just one jacket. But the jacket has been presented in more than 80 different ways; in every photo the jacket jumps on your face but in a different way. Models, actors, actresses, musicians and designers have worn this Chanel classic in a striking fashion: American actress Dakota Fanning pairs it with a white evening gown while Sarah Jessica Parker isn’t even wearing it but rather waving the jacket, and Dutch model Mark Vanderloo perfectly couples the jacket atop his boxers, revealing his bare chest. Among other celebrities who have effortlessly ensemble the little black jacket with their designer wear are American Vogue’s editor-in-chief Anna Wintour, fashion designer Alexander Wang, musicians Theophilus London and Kanye West, and one of the most prominent one, Waris Ahluwalia in his striking beard, turban and the jacket, of course. But while the celebrities make a visibly prominent appearance in the photos, it’s the little black jacket that steals the show. One piece of clothing from Chanel, countless looks and very camera-friendly celebrities — that sums up the experience. If you’re in London, highly recommended; the exhibition runs until November 4. If not, the “The Little Black Jacket” is on tour. 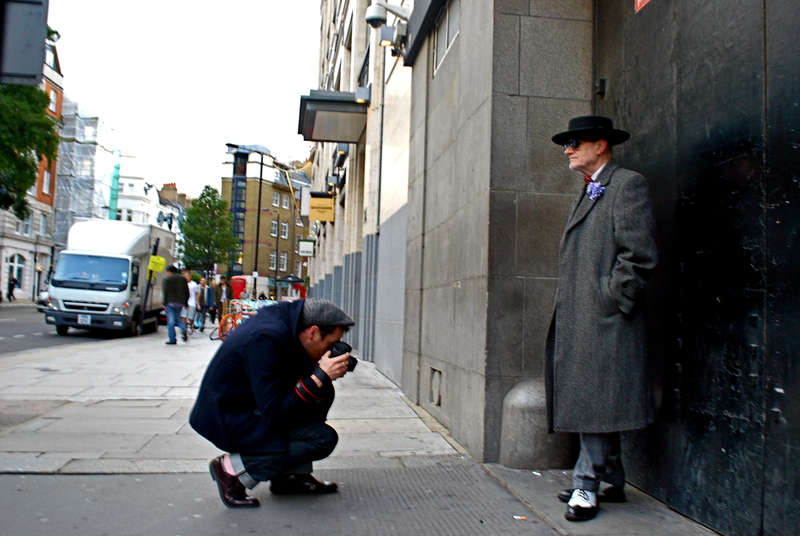 On a regular day, Jonathan enjoys photographing street style. In this photo, he instantly recognizes the style of this 69-year-old artist and captures it for his blog. Today marks the 100th day for 100 beards, 100 days, photographer Jonathan D Pryce’s project that couples street style photography and beards. Jonathan, who is now one of the 100 bearded men, is on a mission to photograph London’s best bearded men in the streets of the British capital. Last week, I joined Jonathan on his work day. We started walking from Covent Garden to Soho, almost to the boundary of Piccadilly and then to Carnaby Street where we finally spotted the beard of the day. And trust me, it was not that easy. While Jonathan has taken tons of photos, his selections, which will be published in a book form by the end of this month, are featured on his blog; others will however have a place on the book. Also, some of his selected photos will be a part of an exhibition at the Lentos Museum in Austria this month. Stay tuned for my story where I talk to Jonathan about his early life, fashion, photography, interests and inspiration, including beards. For now, you might as well consider growing one? You can check out Jonathan’s work here. It’s been a fashion-filled week: from a photo shoot to Social Media Week London’s fashion-related events, during the past seven days, the “F” word was in the tip of my tongue. Well, fashion, obviously. And the list of people I have met and interacted has presumably been the highlight: from GQ.com editor Andy Morris and deputy editor of British GQ Bill Price to Matthew Zorpas, the second best dressed man in Britain, Jonathan Daniel Pryce, fashion blogger and photographer, and lecturers from the London College of Fashion. Just days before that, I was coordinating a photo shoot with a Nepalese model and an upcoming fashion designer Eshan Kali. It was a great experience, and one of my first in London. The shoot is for a story I am working on this upcoming Nepalese talent who has modelled for reputed UK designers and been a part of some of the London Fashion Week shows. The photo shoot certainly brought back memories from Nepal – the photo shoots I coordinated with my friend and then colleague Sumina Karki for Republica’s Sunday Style page, the running around, trying to get hold of models, arranging studios, clothes and everything else in between. Fun days. Here is the glimpse from last week in pictures. The first time I saw Kutumba was during the 2010 Jazzmandu. I had returned to Nepal after a long time, and watching this Nepali folk music ensemble in an international jazz festival hosted annually in Kathmandu was a great musical experience. Since 2010, I have heard Kutumba at various venues, and every time it has been a different experience, including the one in London yesterday. 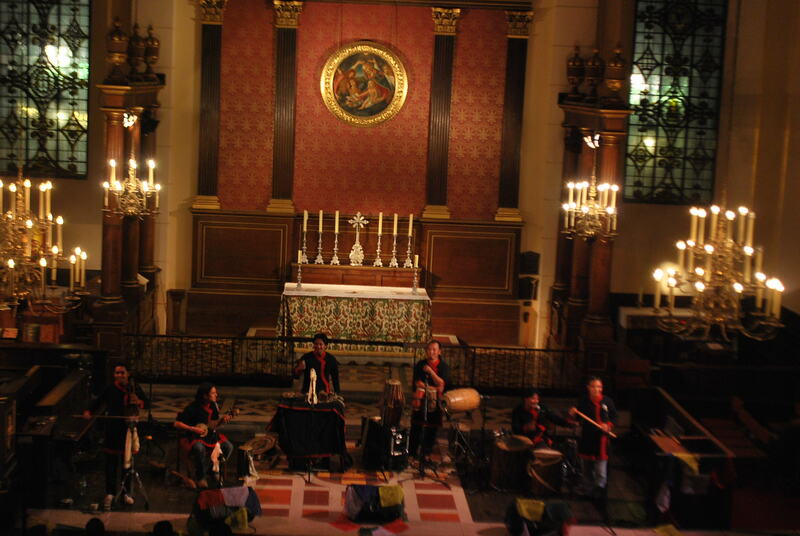 It was Kutumba’s maiden UK tour, and their first performance in London. Just the fact that they performing at St. Paul’s Church in Covent Garden, also known as the Actors’ Church, was different, but their line up was particularly diverse than what I have heard. It certainly sounded like they were prepared to play for the Nepali diaspora with a mix of original compositions as well as classic Nepali tunes. From Nepali folk to film soundtracks, Kutumba’s tunes brought Nepalese living abroad closer to home. Just before the show, I talked to Pavit Maharjan, Kutumba’s percussionist. I have met him several times in Kathmandu, and it was good to see a familiar face, and a popular one at that, in London. He told me it was a “totally new experience” for the band being in the UK for the first time. Moreover, the band members told me that their collaboration with Scottish musicians during their Scotland performance was rather unique; it was a fusion between Nepalese folk with fiddle and bagpiper. In London, they were successful in doing that. For London-native Madleine Marsh, Kutumba was a “real surprise.” The 51-year-old said she heard about the concert from a Nepalese friend and did not know what to expect. “I knew nothing about Nepalese music, and I love it now,” she said as she wiped her sweat as she exited the dance floor. Kutumba’s music has also helped Nepalese youth to connect to folk music, partially, if not in its full entity. Their music is enjoyable yet it retains the ethnic flavors of the diverse Nepalese culture. Kutumba gives young Nepalese an opportunity to like Nepali folk music. They have mainstreamed folk music to a certain extent and their collaborations with commercial Nepalese artists have further aided in its popularity. At Jazzmandu, the band collaborated with Cadenza Collective, a popular jazz group. At an event in Kathmandu Durbar Square, a cultural square in central Kathmandu, they played together with Nepalese rock group Albatross for the first time–it was a well-crafted musical camaraderie. But one of Kutumba’s best performances has to be at the Rashtriya Nachghar in Kathmandu in June. They performed alongside pop singer Astha Tamang Maskey and rock band Jindabaad. The fusion of pop, rock and folk created a sound that was creative, commercial, very Western and yet very Nepali. With eight years since its existence, Kutumba has produced five albums and in their performances they play their original compositions and improvize other Nepali tracks otherwise. One of my friends argues that listening to Kutumba gets monotonous after seeing them live for a few times. I agree. But I think what makes the difference is the setting and the venue itself, and of course the crowd is always different, which makes a difference too. Though they played some of the same tunes, seeing them during Jazmandu was totally different from seeing them at the Rashtriya Nachghar in June where they included a group of women folk musicians playing the dhime, a traditional Nepalese percussion. One of the best parts of watching Kutumba live is to just see them perform. Every time I see them, I see a passion in their performance. While performing, they interact through their eyes and smiles among themselves. And just looking at them, listening to them, you can tell that totally absorbed into it. During the 90s, Sur Sudha, a three-member Nepalese musical trio, made Nepalese folk music popular locally and internationally using traditional instruments like tabla, flute and sitar. Their compositions are highly acclaimed and the trio has also been accredited by many titles, including Nepal’s musical ambassadors. Kutumba is in a similar league, but they have managed to incorporate some modern sounds to their music. This has therefore helped them to become a more commercial and accessible to young ears for whom the folk sounds have become more enjoyable, something they can dance to.